I play a John Smith designed "Senior 20" hand cranked organ which I built myself form plans. You can see it in more detail here. The John Smith Senior 20 is a 20 note (or 20er) organ. It plays paper rolls, and is a simple valveless design. The Smith Senior 20 and Busker organ designs are good beginner's projects. You can hear a sample of Epona's music in Here Comes the Organ Man (a van Oost arrangement) This is stored as a 1.6 meg .MP3 file. 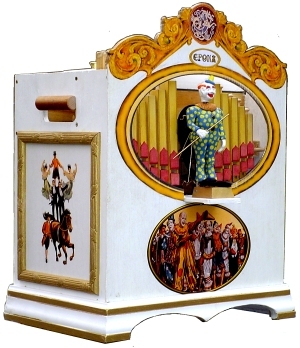 I finished construction of my John Smith design "Senior 20" hand cranked organ in March 2006. Some of my personal modifications to the Smith design can be seen on Melvyn Wright's web pages at www.buskerorgan.com Mel has recently released a book on constructing simple John Smith type organs.In my opinion, Mell sells the best 20er rolls in thew world, whether you want them in Smith format or the Carl Frei format aka the Raffin 20 format. Many mechanical organs are now built with MIDI (Musical Instrument Digital Interface) systems or have had MIDI systems installed to supplement or replace paper roll or book music systems. In addition to my first hand experiences with our OSI organ, I have been studying MIDI systems in general, and have started a page of information gleaned from a variety of sources. Notes on the use of MIDI File Mapper. I began punching my own 20 note paper rolls for my organ a number of years ago. I am using a home-built traditionally styled one-hole foot operated punch, and guiding the paper by hand. I wrote an article "Hand Punching My Own Rolls from Midiboek Templates" for the COAA magazine The Carousel Organ. which describes the punch and my use of it in some detail. The article, as it appeared in the magazine, is posted on this site as a .PDF file. I'm happy with many (but not all) of the results of my work. I now have so many rolls I have to decide which to leave at home when I head out to a rally. I punch from computer print-outs generated using the MIDIBoek program, and I have created a number of "Gamma files" in MIDIBoek format for use in my work. Click here for a link to my downloadable MIDI files and information on custom punched rolls. Bob R... in Olcott, NY asked for some help in getting started in producing some rolls for his Clariona Organette. Later Edwin M. read the page and asked about rolls in the 14-Note Common format. I have placed a number of useful files and some explanation here. Between about 2000 and 2010 English amateur organ builder Bob Essex sold a booklet describing a computer controlled roll punch called the MIDster which produced music rolls for small organs from MIDI files. It runs on "PCs" using the DOS operating system. I bought the plans and started building one, but for several reasons I did not complete it. It appears that Bob is no longer supporting the machines. The abstract below contains only information regarding operation of the machine, and was created solely for the use of individuals who may have acquired one of these elderly orphan machines. Running the MIDster Punch - a .ZIP file with instructions and software. Spools can be a major expense if you start punching your own rolls. Here is a description of how I make my El-Cheapo spools. I am an enthusiastic member of COAA and frequently attend COAA rallies. In 2012 I was elected to the COAA Board of Directors, and I moved up to Secretary in 2016. COAA holds about 6 to 8 rallies each year in about as many states. The rallies are good fun, and a great way to learn about outdoor mechanical music in all its aspects.